Perfect for little hands to hold, this melamine baby sippy cup is the cutest! It’s made of melamine for lasting durability. It’s also BPA free. 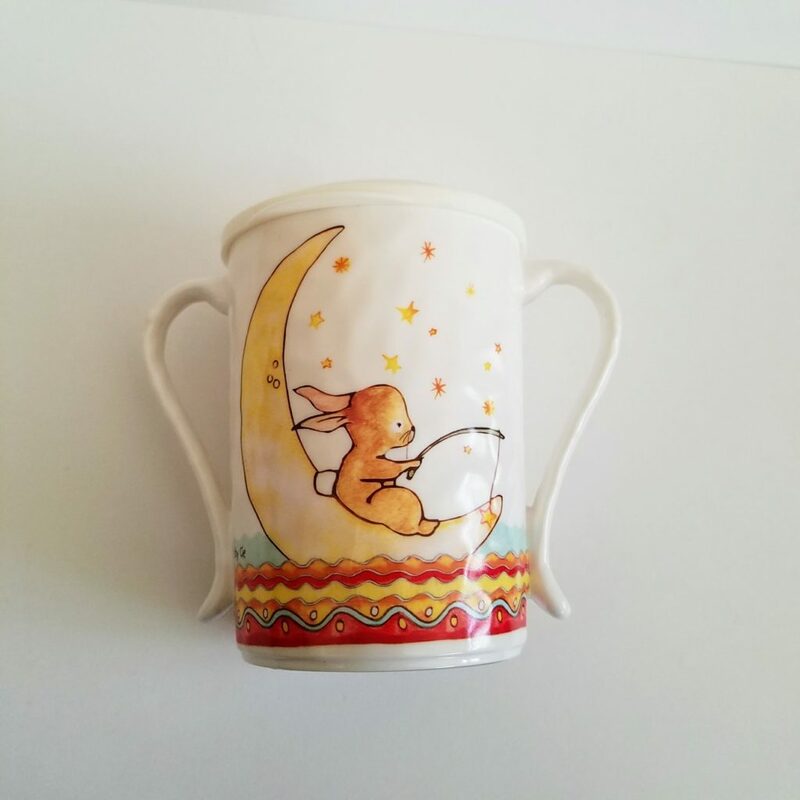 The adorable little bunny rabbit fishing for stars and catching them makes this sippy toddler cup unique and delightful. Sippy cups nowadays are not like this one. This one is just right for the vintage ideal household, the old fashioned retro baby, the sweet pea in the family. 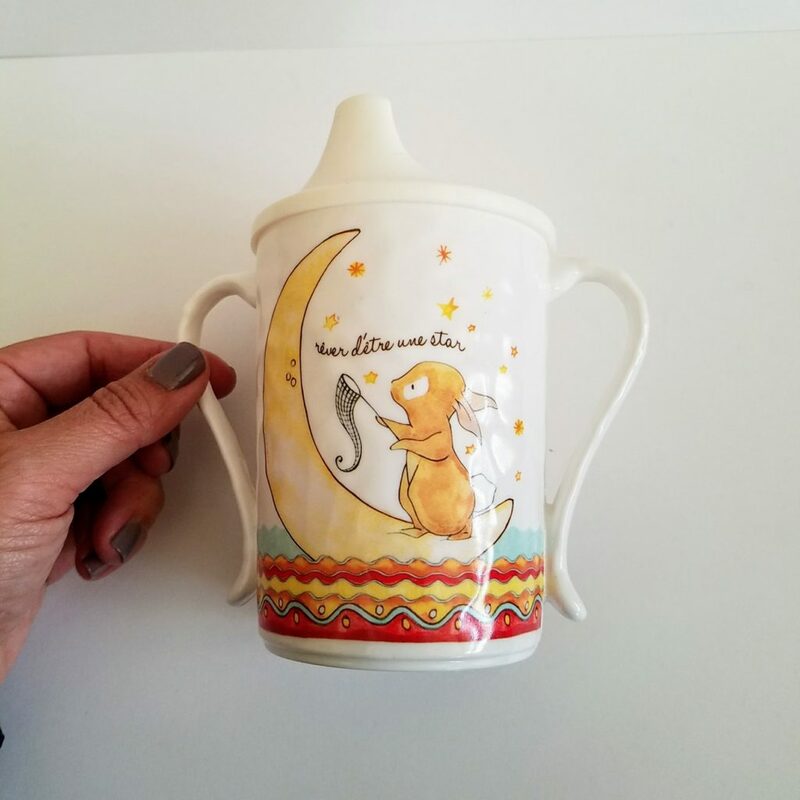 For those of us who adore cute things, little things and sweet things, I know you’ll appreciate the illustration on this sippy cup. When I saw this one I knew I had to pick it up for TheWeeBitThings etsy shop, where it’s been newly listed for sale with additional information. I really enjoy working with wool felt and the needle. The craft of shaping and sculpting the wool is called needle felting. A couple of reasons why I liked needle felting right away is because I noticed that it could quickly reduce stress and because it’s very forgiving to a beginner. Even if whatever I’m working on doesn’t come out exactly as intended, it doesn’t come out horrendous, either. That makes me want to keep on trying it out. Another reason to like it is that it’s a pretty minimal craft. The basics are: a needle, wool batting and a foam felting pad or you could use a kitchen sponge. From that point, you can make whatever you want! I just love that. The penguin wooly had a good albeit short life. Unfortunately, recently its life ended abruptly after a visiting dog mistook it for a toy stuffy after the wooly had fallen off its shelf. Sad. I reflected on it being my first needle felt wooly and comforted myself by promising the creation of more wooly’s to come. The latest wooly art that I made was for my Aunt’s birthday. Like me, she likes little cute things, especially if they’re small, have fur and are rodent- like. 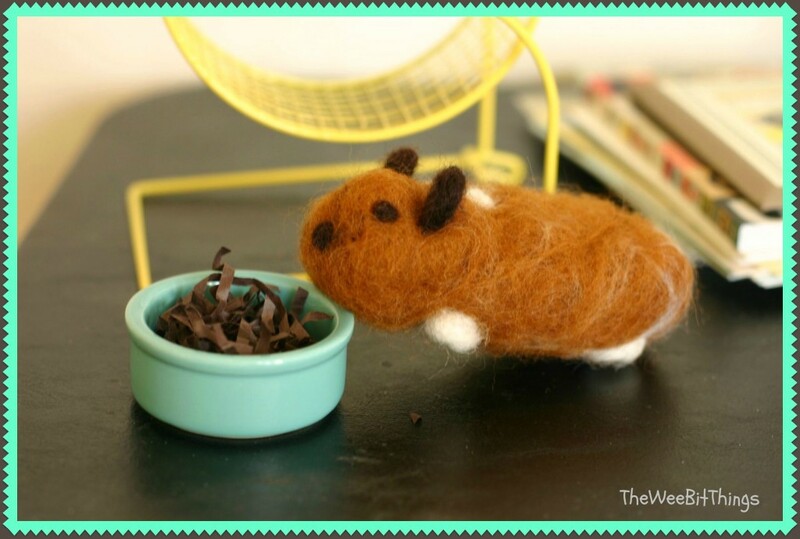 Wool felt hamster with a food bowl and hamster wheel. I can’t wait to eat! Then go on my funwheel! Felt is an industrial material. Felt is used on stuff like the underside of cars to protect the car body, as well as in the construction of a home. The finer the wool, the softer it is. Think of merino wool, you see it a lot in clothing. Coarse wools are used to make carpets. Coarse wools felt quickly. Softer wools take much more time to felt. Wool roving is rolled up wool that you get in thin 5 inch wide strips. The fibers are all straight and go in one direction. It looks smoother and can feel softer. Wool batting is wool that’s rolled up into sheets. They’re wider than the wool roving and can be fluffy-like. The fibers are not straightened nor directional. It looks a little coarser than wool roving. Felting needles have different gauges and therefore will felt the wool a little differently. The felting need was created and used for industrial use. In the 1980’s, David and Eleanor Stanwood developed the felting needle into a handcraft. Needle felting is different than wet felting. Wet felting is the oldest technique of the two. Historically, it’s also been the one that artist use more. Wet felting involves rubbing soapy wet fibers together. 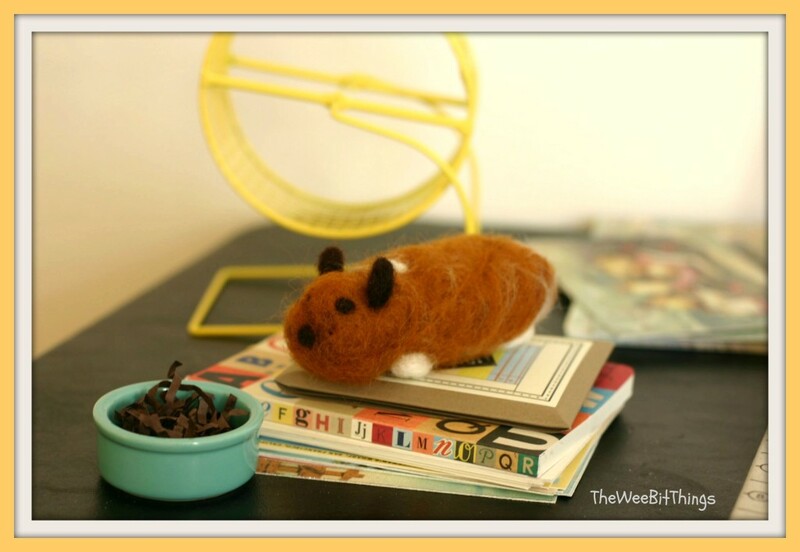 Needle felting is a dry process that has been growing in popularity. 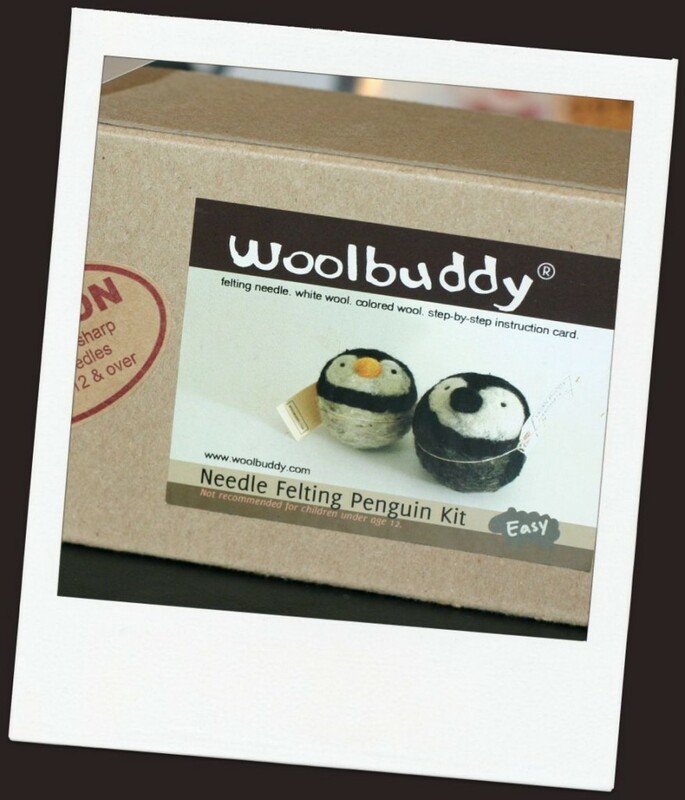 Do you want to try needle felting? Just go for it! It’s fun, doesn’t require a lot to begin, and it’s not rocket science. But I mean, if you’re into rocket science, that’s cool, too. I get it … Still! 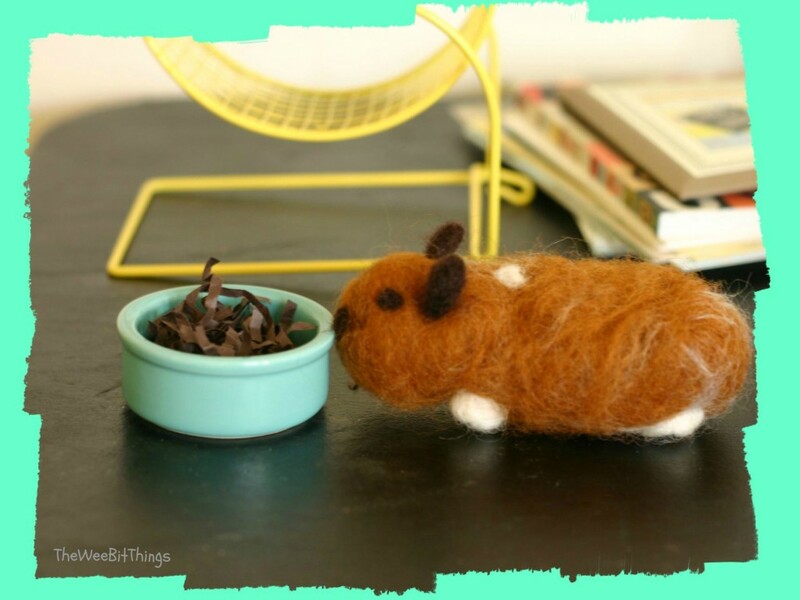 You’re going to love needle felting. 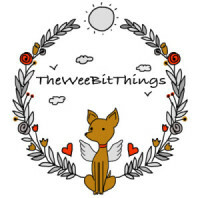 ‘Til next time, keep enjoying the little things: because it’s about the little things in life! So, there are times when I just don’t have much to say but there’s still something I want to share. One of the ways I can do that is through photographs. Today, is a perfect day for me to do just that. Not say much but still share. 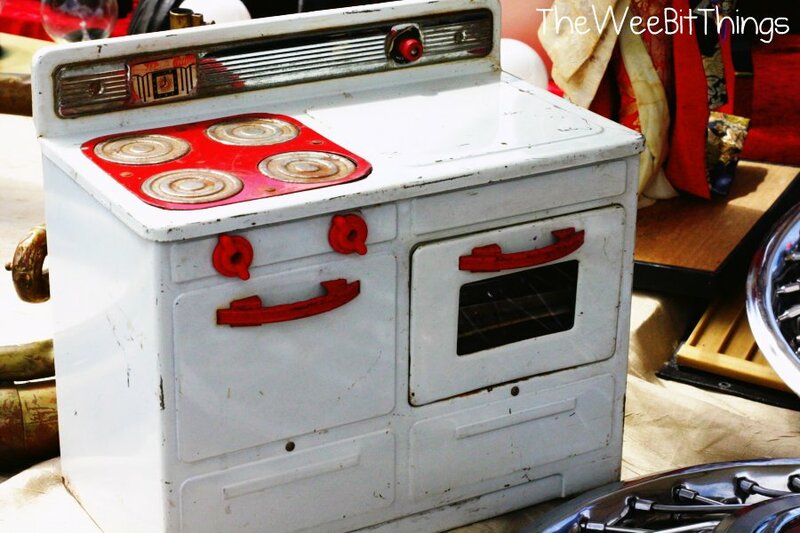 A pretty banged up vintage red and white tin play stove that I believe is from some time in the 1950’s.